Ever since the idea of Infinity Gems was confirmed in Thor 2: The Dark World post credits, people have been wondering when and where the remaining gems might appear. So last April when Captain America 2: The Winter Soldier was released, we immediately started wondering if the return of Loki’s Scepter hinted at it indeed being an Infinity Gem. It just seemed to make sense, and then when it appeared a few months later during Marvel’s Avengers: Infinity War teaser, this seemed like the confirmation we wanted. Though despite these beliefs and seeming confirmation, people still came up with reason upon reason why this couldn’t be so. Of course now we have DIRECT confirmation from Marvel and Feige that Loki’s Scepter is indeed the Mind Gem; but many of those initial questions and points of disbelief still remained. Well I’m here to not only answer those questions; but also one of the biggest ‘deus ex machina’-like problems with the plot of The Avengers (2012). It’s so simple, you’ll hit yourself for not seeing it sooner. Why Did Thanos Give Loki The Scepter/ Mind Gem? The primary questions/concern about Loki’s Scepter being an Infinity Gem is WHY would Thanos give one of the Gems to Loki if he was trying to collect all six Gems in the first place? The answer is actually a lot simpler than people would believe, which probably explains why it has led to so much confusion. Short and sweet, Thanos never saw lending the stone to Loki as a risk. Special thanks to Marysa from Keep Calm & Kneel To Loki who goes into incredible detail about this whole tortured appearance. Bravo! Now as for using a Gem to get a Gem – as the old saying goes – you have to spend money to make money; and Thanos took the same approach with the Infinity Stones. Additionally, you have to remember the final discussion between The Other and Thanos, when The Other reveals to Thanos that the Earth is stronger than they expected. In Guardians of the Galaxy we even saw how much the Mad Titan Thanos looked down on other powerful beings – specifically Ronan in that case. If he can laugh at Ronan, then Thanos truly believed that the Earth posed no threat to his plan. Heck, even The Other originally laughed at Earth as offering a ‘meager fight’. So if Thanos were to lend the master of tricksters the all powerful Mind Gem, then there would be no way the weak and defenseless Earth could withstand this combination. Thanos’s investment would pay off and his one Gem would become two. Of course, that’s not how it turned out since they underestimated Earth. 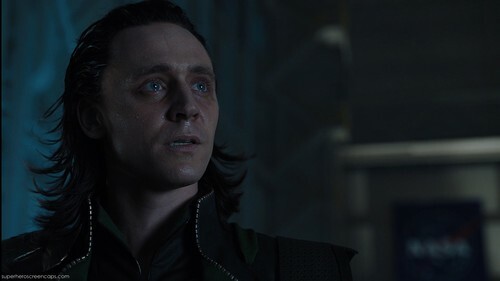 One of the biggest confusing and seemingly contrived moments in The Avengers (2012) is towards the end of the film when Selvig snaps out of it and reveals that even while he was under Loki’s control he knew enough to build in a fail safe swift and then mumbles something about how ‘the Tesseract can’t fight [because] you cant protect against yourself’. Throw in a bunch of moments when they say the Scepter and the Tesseract give off similar energy readings, and it seems like the two are the same. Well, yes and no. You see, the Tesseract and Scepter ARE the same; but only in the regard that they are both Infinity Stones. Man-made devices would have read the energy as similar because both are Infinity Stones and are the concentrations of their respective singularities. They wouldn’t know enough to say, oh this gives off this type of cosmic energy and that one gives off another’. They’d only be able to read it as cosmic energy/singularities. There are various types of radiation out there; but it takes much more fine tuned equipment to know what type of radiation. So it’s not that the Tesseract couldn’t protect against ITSELF, it’s that the Tesseract couldn’t protect itself against the Mind Gem since it was also an immensely powerful singularity. The expanded confirmation of this comes from the Avengers: Age of Ultron prelude novel which shows a scientist discovering their similar – yet different – wavelengths while also showing various Hydra experiments to transfer the power to weapons, which is what they did with the Tesseract before it. The Scepter isn’t powered BY the Tesseract, it has a power all of its own which while being similar to the Tesseract ISN’T from the Tesseract. As we learned in Guardians of the Galaxy, an Infinity Stone reaches its full potency whenever it comes into contact with organic matter. This explains why when Loki touched Tony Stark’s chest, the stone didn’t take effect. It hit his arc reactor, not his actual body. Though it’s not the stone itself that’s really touching the victim; but rather the tip of the Scepter. How does that work? Well again, in Guardians of the Galaxy we saw how someone could wield an Infinity Stone via a weapon. This is what Ronan did with his hammer, Loki with the scepter and what Thanos will eventually do with the Infinity Gauntlet. It allows the Singulatiry of the Gem to be more controllable while still retaining its powers. Heck, even those in proximity to the Mind Gem can experience a flaring of tempers and emotions – as we saw in The Avengers while everyone was standing around the Scepter in the lab. So for anyone wondering why Barton and Selvig could break the power of the Mind Gem by simply being ‘bumped on the head, there are 3 things to remember. They were touched by the Gem once and that was it, so it’s power could have began to lessen over the day or so they were under Loki’s control. Taking these three facts together, it becomes pretty understandable why they were able to break the influence of the Mind Gem. The Mind Gem wasn’t fused with them; but rather made them controllable for a while. The more time that passed without direct exposure to the Mind gem, the more likely they were to break out of it. In addition to all the talk about Loki’s Scepter, there’s also been A LOT of back and forth about the Maximoff Twins – Quicksilver and Scarlet Witch – and how they’d be introduced into the Marvel Cinematic Universe without the use of the word ‘mutant’ or their father Magneto. Well again, last April after they first appeared in the post credits for Captain America 2: The Winter Soldier I – along with many others – hypothesized that the ‘experiments’ Baron Von Strucker was referring to had to do with Loki’s Scepter/ The Mind Gem. As time went on, this idea grew more and more plausible until Agents of SHIELD began introducing Inhumans ahead of time via a Terrigen Crystal called ‘The Diviner’. After some saw a pre-powers version of the Twins in a rebellion with tear gas, they suspected the gas could be Terrigen mist and so a bunch jumped on the Inhumans bandwagon. Well thanks to a new prelude comic for Avengers 2: Age of Ultron, we know now that their origin is indeed via experiments with Loki’s Scepter. As the comic reveals, before Project Insight got underway Strucker’s SHIELD base was already starting experiments on the Scepter and were ready to move into human testing. The guinea pigs for these experiments came from local anti-war protests where Hydra – still masquerading as SHIELD – promised to give them power to stop the wars in their country. As the dust of Project Insight settled and the base was exclusively Hydra, we catch up where Captain America 2: The Winter Soldier left in the post credits. Now just because the Twins were created with the Scepter’s powers, that doesn’t mean they not Inhumans. Whether Marvel wants to call them Inhumans or ‘Miracles’ is up to them; but you must remember that ‘gifted’ individuals existed in this world before all this as Agents of SHIELD’s first season showed. Then again, none of their powers were as extreme as Quicksilver’s or Scarlet Witches. Though the most important thing to remember about their remaining potential status as ‘Inhumans’ is that ‘Inhumans’ have two stages. Skye and Raina might have become Inhuman after interacting with the Terrigen Crystal Diviner; but they were special before that. We saw how they were able to interact with such items yet not be killed. So the same could be true for the Maximoff twins. Had they been given a Diviner, they might also have been spared and then transformed due to a preexisting ‘Inhuman’ quality about them. This would also explain how they survived the ‘experiments’ and others couldn’t – similar to the interactions with the Diviner on Agents of SHIELD. So it is very much possible that the twin are indeed Inhumans who’s had their powers awoken not by a Terrigen crystal; but by the Mind Gem – the ultimate life hack. I hope you enjoyed this article, and stay tuned for more Marvel awesomeness both here and on Facebook. where? i have not seen any such confirmation. Well the teaser for Infinity War was the start; but Feige later spoke about Loki’s Scepter indeed being a stone and how that teaser was supposed to be the official unofficial reveal. I’ll try to find the interview for you. As for it being the Mind Gem, every instance of its use was in swaying peoples minds and making their emotions get the better of them, which is Mind Gem territory. There’s nothing else for it to be since its characteristics don’t fall under space, reality, soul, time or power. Other stones have overlapping abilities and uses to be sure; but Loki’s Staff has accessed minds solely; and there’s only one stone that can do that. if you could find that Feige statement, that would be great, thanks! if the scepter is holding an Infinity Stone, it must be the same as the Tesseract, because it’s the same color. Well remember that the Tesseract is already its own stone, and is being held on Asgard as we learned in Thor 2. So the scepter must be a different one. As for why the same color, no clue. perhaps the tesseract is actually a different stone color on the inside of that cube, just like the stone in GOTG was purple within its container. But yah, the similar color is strange; but they act so differently they can’t be the same stone at heart.